This handmade resin ring jewelry piece is a pale green background with abstract chips of blue, shades of green and purple. 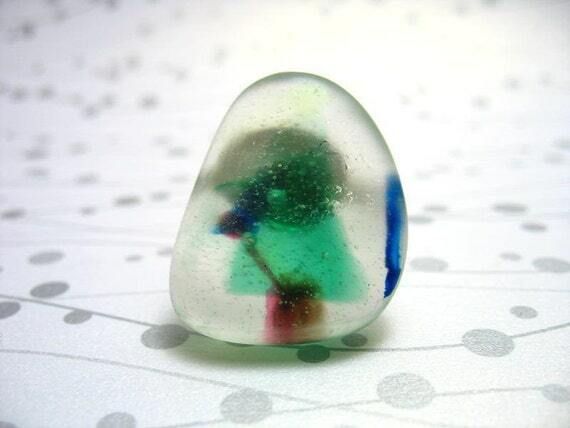 This gives the handmade resin ring its abstract art look. You will discover more 'hidden' treasures the more you gaze into the resin ring. The original for the handmade resin ring jewelry centerpiece is a pebble that I found on one of my walks. After a spot of cleaning and polishing I made the mold and started making the handmade resin rings of ‘rock jewels’. These handmade resin rings of 'rock jewels' have been attached onto an adjustable silver coated ring setting. The handmade resin ring fits most finger sizes.